A long-time mini-grail of mine was a Seiko Spring Drive. At first when I saw the Spring Drive watch, I wasn’t too interested. While I was in admiration of the state-of-the-art movement and the perfectly smooth sweeping second hand, I was still hung up on having an automatic movement that didn’t have any electronics in it. Over time, as my appreciate of fine timepieces has matured, I have come to grow quite fond of the Seiko Spring Drive and the qualities that set it apart… the more subtle nuances of what the Spring Drive truly represents. 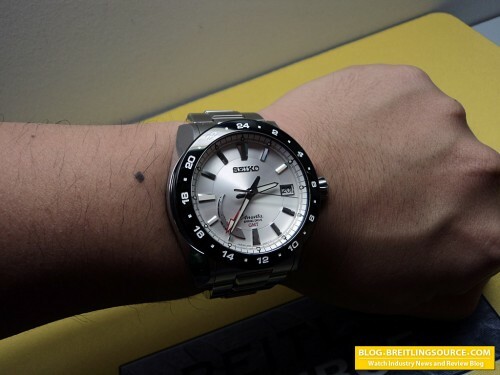 The Spring Drive endowed watch that I purchased is a Seiko Ananta GMT Spring Drive, which is not from their highest-end Grand Seiko line, but from their line that is just under the Grand Seiko line. A source tells me that Spring Drives are going to be discontinued from all but the Grand Seiko’s now, in order to elevate their standard and maintain exclusivity. This Ananta Spring Drive retails at $4,300US, which is one of the more affordable Spring Drives on the market. My Ananta Spring Drive features the silver/white dial with very beautifully polished and applied markers. The markers have a iridescence to them, which almost has a pearl-like effect. This finish is also present on the movement, which I’ll show below. Bezel is a polished PVD-coated stainless steel with painted white GMT Arabics. The bezel is fixed so cannot be adjusted for a quick timezone change. 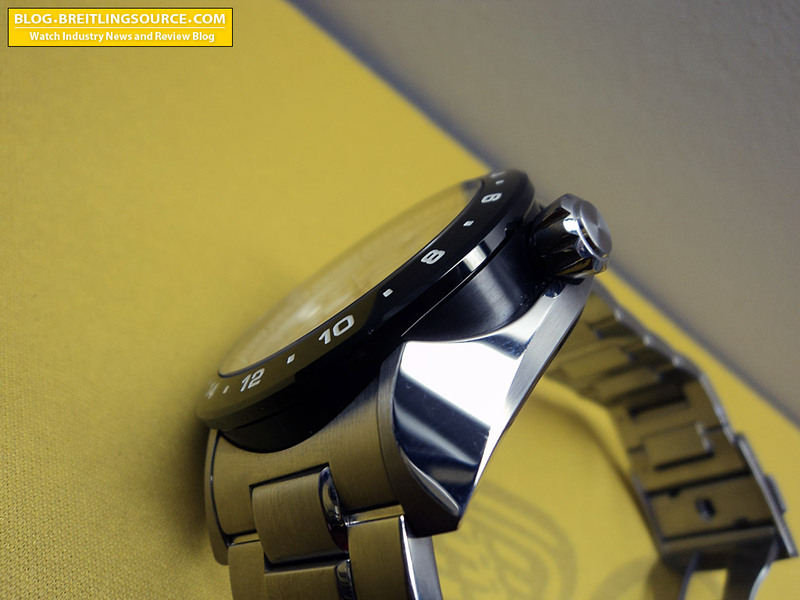 Case is a very healthy 46mm in diameter, and the watch wears like every bit of it and more. The crown does not screw down, but can be used to wind up the movement – which you can see as the power reserve meter moves while you wind. Note the complex brushed pvd, polished pvd, brushed and polished stainless finish of the case with multimple articulations and facets. It is a beautifully crafted case and immediately speaks to the quality and attention to detail that Seiko has put into this timepiece. Another shot of the other side of the case, just to show how clean and polished the watch looks. It is very refined, but also very beefy. I couldn’t find a spec on the thickness, but I tried to measure and it looks to be about 15mm thick. 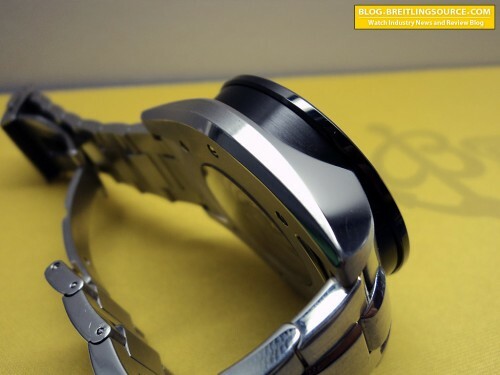 The slightly curved back really sits well on the wrist so it works well even with smaller wrists. Here’s another head-on shot that shows off that iridescence of the markers. Notice the luminous hands and small lume dots above the markers on the chapter ring. Lume is very good on this watch. The power reserve indicator is located at 7 o’clock, and the only odd thing I find about it is that the arrow points down on a full charge, not upwards. The dial is beautiful, and also has a slight iridescence to it on the surface of the silver. 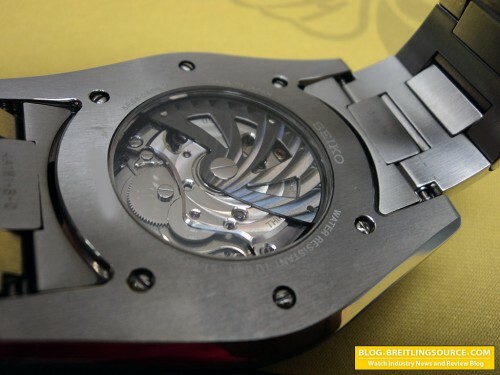 And there it is, the heart of the watch. 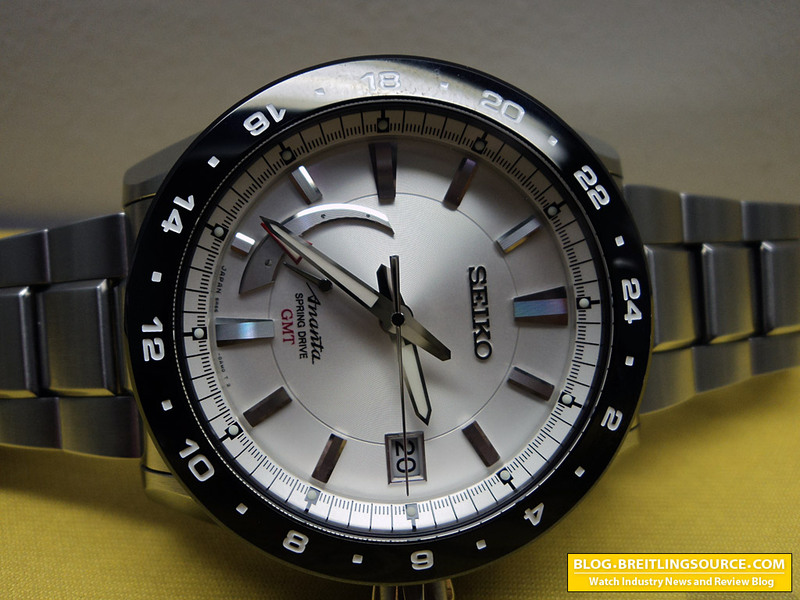 The Seiko Spring Drive Caliber 5R66, which is a beautiful sight to behold. This is an immaculately decorated movement from Seiko, and the level of finish surpasses any Swiss watch I have ever seen in this price range. The circular graining decorationg on the rotor and bridges is immaculate, and most if not all the visible screws and cogs are fully polished. 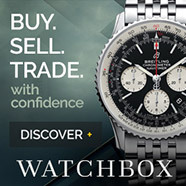 That doesn’t count the fact that this watch is mechanical while still being much more technologically advanced than other similarly priced watches. The movement is simply outstanding. The GMT Hand also operates the way a GMT hand should, like a few select others such as Rolex, Omega, Panerai. This means the main hand increments in 1 hour notches and the date adjusts with it rather than the GMT hand being the one that moves in the 1 hour increments. This allows much easier adjustment of the local time when you are travelling. Here’s the wrist shot on my 6.75″ wrist. One of the things I really love about the Ananta’s styling is that they are uniquely Japanese in their look, and won’t get mistaken for a European styled watch. I can’t really explain what I mean by that aside from when I wear it, I can tell it distinctly doesn’t have a European or American style to it possibly due to its design heritage being patterned after the Japanese Katana Sword. 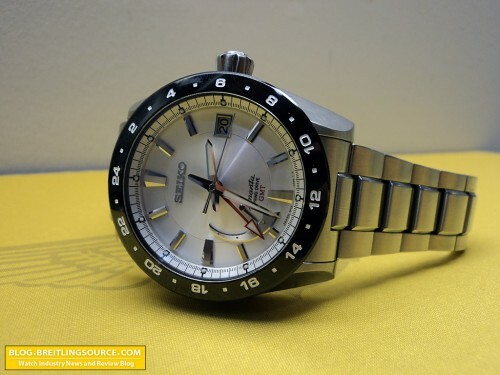 It is very uniquely Seiko, and beautiful in that respect. Well Done Seiko. While the Ananta’s bold styling isn’t for everyone, it is for me, and the Spring Drive makes the deal that much sweeter. Crystal: Sapphire AR Coating Front, Sapphire Back. Check out the Ananta video from Seiko below that shows some of the Ananta’s features and also the Spring Drive.